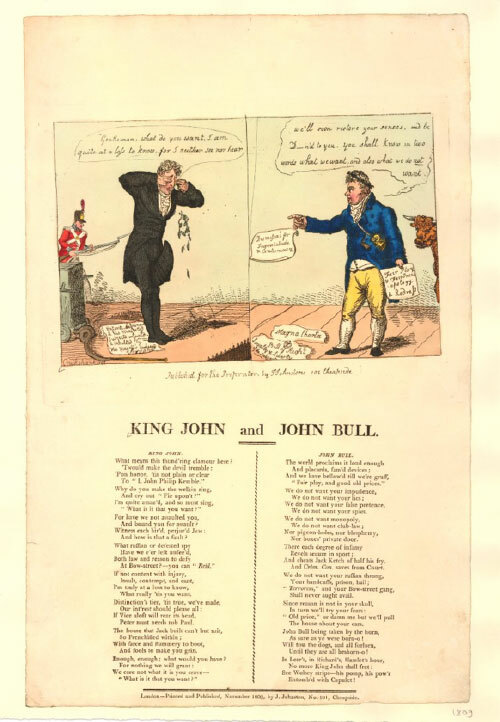 Isaac Cruikshank, King John and John Bull (November 1809). This broadside ballad, with lyrics below and an image at the top, features a weeping Kemble, tucking his tail between his legs and crying, “Gentlemen, what do you want? I am quite at a loss to know, for I neither see nor hear.” John Bull, who holds a sign saying “Fair Play / & Fair Prices / apology / & Redress” replies, “We’ll soon restore your senses, and be D—-n’d to you. You shall know in two words what we want, and also what we do not want.” For information on the character of “King John,” see figure 20. Courtesy of the British Museum.